“I never learned anything from listening to myself talk…you are more powerful than you think you are, you just have to do the work and it will all work out” Emily was incredibly inspiring to talk to. What I gathered from our brief conversation is that Emily doesn’t over think things. She wanted to become a doctor, so at age 39 she went to medical school. She has to get people up mountains, so she figures out how. She wants to help others, so she does it. 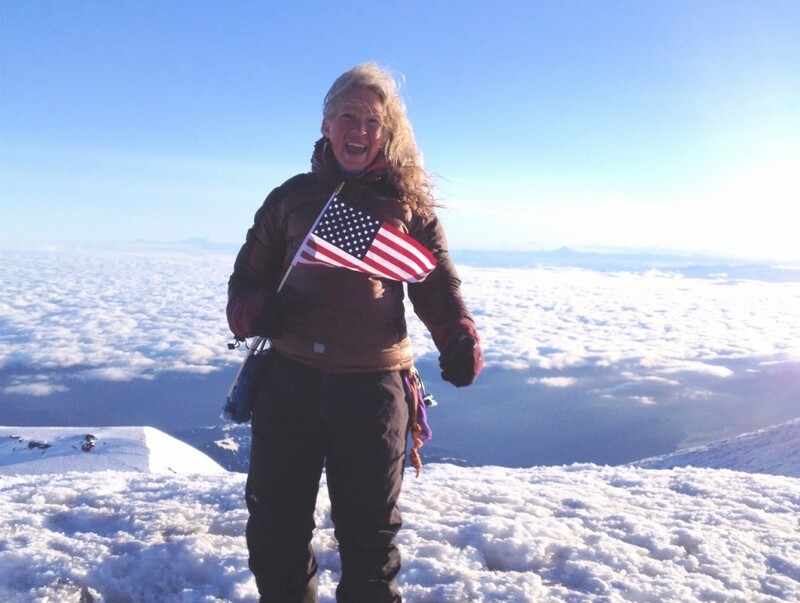 Emily started her climbing career by jubilantly summiting Glacier Peak when she was 13. She spent her teen years climbing in the North Cascades of Washington, and in Oregon and British Columbia. After college, she instructed for Outward Bound in Joshua Tree and Central Oregon, then began guiding on Mt. Rainier in 1989. Over the years she’s also enjoyed guiding in the North Cascades, Alaska, Mexico, and the Himalayas. Adventure races, whitewater competitions, and personal travels have taken her to the rivers and mountains of every continent except Antarctica (it’s on the list, but she’d rather go to the Space Station first!) Beyond her alpine life, she’s lived/studied/worked in the Dominican Republic, Taiwan, Thailand, France, New Zealand, Australia, Israel, Indonesia, DR Congo, Nepal, and Bhutan. Her training includes EMT-B-IV, Leave No Trace Trainer, AIARE Level 3 Avalanche Certification, and MD (FACEP). When she’s away from mountain guiding, she works as a whitewater guide/instructor (Orion Expeditions), professional ski patroller at Stevens Pass, WA, and ER doc with an interest in high altitude medicine. She’s Emergency Department Director at Cascade Medical Center in Leavenworth, WA, works for the US Army as an ER doc and Mountain Medicine (DIMM) course instructor, and is a clinical instructor for the University of Washington School of Medicine. In all of her spare time, she enjoys backcountry skiing, writing, trail running, mountain biking, and the occasional refuge of silent meditation.